Brenden was super helpful and made himself available for all of our needs We had an excellent experience. We loved it! We will be back soon! This property was perfect for families. The team was very responsive and helpful. Good communication: texts made it easy. Helpful staff. Super easy check-in and check out. (Just entered the code they texted for the gate and on the electronic lock on the condo and voila! We were in!). Didnt have to do a ton of stuff for check out, just load the dishwasher and strip the linens. Easy-peasy! Loved the easiness of our stay! Thank you! Updated condo right on the beach! Layout was great! Three full baths for 3 bedrooms plus bunk beds. Amazing view! Building and porch designed for an awesome view of the beach, ocean and sunset. The porch angled and wrapped around the side to give a wider view. Lots of natural light in the condo. The beach isnt as crowded as some areas, which we LOVED! Very helpful and quick reponse time when we had a question. Beautiful, peaceful, and convenient access to the beach. Excellent experience- all the way around! Highly recommend 30 A Escapes and loved 12 Walton Dunes! Excellent experience- all the way around! Highly recommend 30 A Escapes and loved 12 Walton Dunes! Loved this fabulous property and definitely plan to stay here again!! 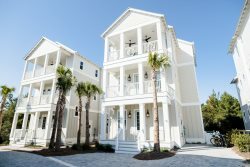 Its right on the beach and at a prime spot on Hwy 30 A but nestled in an spot that keeps you a bit secluded from others. The view is magnificent and perfect for viewing gorgeous evening sunsets. And the townhouse itself couldnt be cuter, cleaner or more comfortable. Love the decor!